One thing I love about InStyle Magazine is that they take items from the Summer and give you ways to incorporate them into your Fall wardrobe. Here are some of my favorite looks for fall that will be sure to use some of those staples from the summer. Dang it, I just returned mine! This girl *loves* lace and crochet detailed tops. Layer it with a jacket, dark denim, and a fall hued scarf and you've got yourself a winning combination. Again, layer it up y'all! 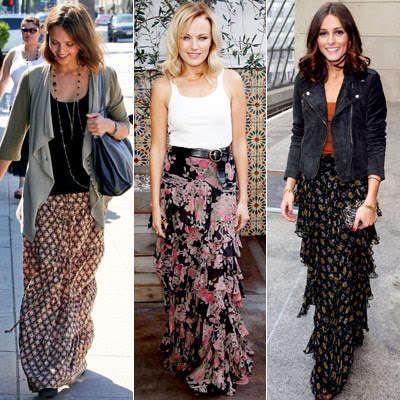 Maxi skirts are easily transitioning into the fall. Just put on a pair of boots and a cardi and you're good to go. I especially love Olivia Palermo's look on the right with a blazer. I will not be participating in this look. Yeah, you know the one. That floral print one you bought when the slightest hint of warm weather came about. Layer it and pair with a pair of booties and you've got a perfect and feminine look for fall. What's your favorite fall style? Can you see yourself rocking any of the above looks? Oh my goodness I LOVE the blush blazer!!! I must find a good fitting one in plus-size somewhere!!! I also am totally in love with the lace and crochet detailing myself! Like over the moon about them! I also love chiffon tops this season too! I think I could rock the jean jacket... I love the idea of the rolled sleeves on them! Yippie for layering + Fall!!! i love every single look - esp. lace and blazers! can't wait to wear more of them. the cool weather just needs to come now! ohhh yes! totally jumping on the demin jacket & tunic looks. 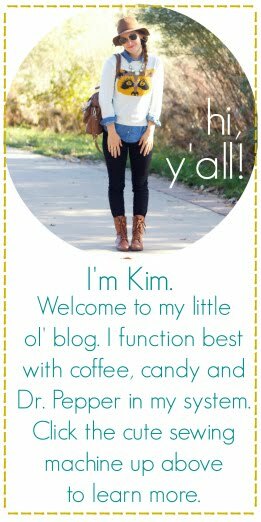 and kim, you look great in anything! !